Diplomacy has never been a politically neutral field of historical research, even when it was confined to merely reconstructing the context of wars and revolutions. 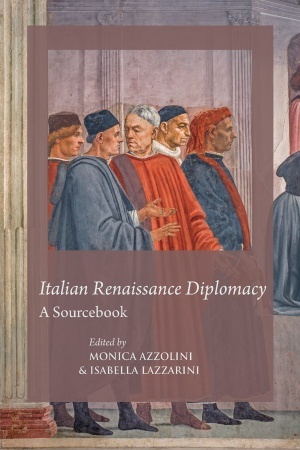 Since the nineteenth century, Renaissance Italy has been at the forefront of scholarship on diplomacy; today, with increasing awareness of the long history of the subject as well as a broader spectrum of case studies, the study of Italian diplomacy has become sophisticated and highly articulated, offering scholars many new directions for further exploration. The aim of this volume is to illustrate the richness of diplomatic documents both for the study of diplomacy itself as well as for other areas of historical investigation, such as gender and sexuality, crime and justice, art and leisure, and medicine. Monica Azzolini is Senior Lecturer in History at the University of Edinburgh. She has written extensively on Leonardo da Vinci’s anatomical studies and on Renaissance astrology. Her first book, The Duke and the Stars: Astrology and Politics in Renaissance Milan, appeared with Harvard/I Tatti Studies in Italian Renaissance History in 2013. She is now working on a new project that investigates the distinctive culture of disaster of early modern Italy from the joint perspectives of religious history and the history of science. She hopes that this project will eventually expand into a more global study of the significance of natural disasters in reshaping the European understanding of nature in the seventeenth and eighteenth century. Isabella Lazzarini qualified as Professor of Medieval History in 2013; she teaches at the University of Molise. Her research interests focus on the political, social, and cultural history of late medieval Italy, with an emphasis on Renaissance diplomacy and the growth of different political languages in documentary sources. Among her recent publications are Amicizia e potere. Reti politiche e sociali nell’Italia medievale (2010); The Italian Renaissance State, edited with Andrea Gamberini (2012), and Communication and Conflict. Italian Diplomacy in the Early Renaissance (1350–1520) (2015).